It includes quality and very motivational programs but if you want to run, you might be better off with a treadmill. 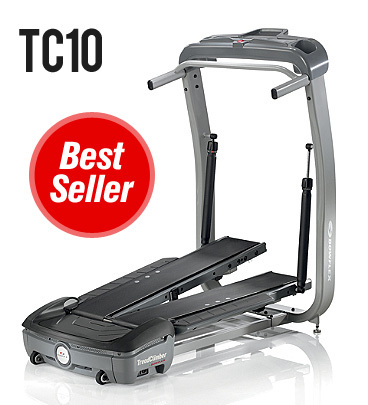 Bowflex currently offers three different TreadClimber products/models: TC20, TC10, and TC5. All of these models have different features available to them. Some of the differences in features include different workout programs, unit weights, and even different speeds. Below, you will see our review of the WalkTC that TreadClimbers actually revealed is the most advanced model which has the most features available to it. Because this model features incline training capabilities, it can really produce excellent results. Studies show that training on an incline can actually double the rate at which one burns fat. Because of this, you are going to be able to experience great results with this particular climber because it has the ability to give you a 40% incline. Incline training lets the walkers be able to get extremely fast results without having to put too much stress on their joints like runners. All TreadClimber treadmills have the ability to input and utilize different preset workouts. However, this particular model goes a step further. It has the ability to offer Goal Oriented Coach technology which essentially allows users to set different personalized training goals and it can also track the results for up to two users at a time. You will also get 5 built in workouts and 3 different landmark workouts that you can complete. These landmark exercises can make things extremely fun and rewarding. For example, one of them puts you in the stairwell of the Statue of Liberty and makes you walk up all of the steps. The fact is, this model has one of the fastest and most powerful motors available on the marketplace. You can actually reach a top speed of 4.5 miles per hour on this model. Another great aspect of this particular machine is that it provides an extremely low impact workout which makes it one of the most comfortable workout machines available on the marketplace. Because it is so easy on your joints and knees, you are going to be able to work out a lot longer on this machine than you would be able to utilize a treadmill. This is ultimately going to lead you towards getting better overall results. The size of this particular model is very compact in comparison to its competition. Because of all of the features that this particular model offers, it is also very robust for its size. This makes it an incredible value and a good choice for anyone that is looking for something more portable and better for those that have limited amounts of space in their homes. Another very good aspect about this particular product is that it comes with one of the best warranties on the marketplace. You will actually be able to enjoy a three year warranty that is whole. This means that it covers everything that could possibly go wrong with your machine. The TC5 and the TC10 actually offer a one and two year warranty, respectively. Another great aspect about getting one of these machines is the fact that Bowflex has their unbeatable 100% satisfaction guarantee on all of their products. This means that you are going to be able to return a TreadClimber within 6 weeks for a full refund on the entire purchase. If you do not like it for whatever reason, you can return it with no questions asked. This particular exercise machine is not meant for running. This means that for anyone that loves to run, you are going to be out of luck with this machine. You will want to consider purchasing another model or brand of incline trainer because you are not going to get the option to run with this machine. Another thing that we didn’t like too much about this particular product is that it does not contain any extra goodies and/or features that you might find on the competition at this particular price point. These features include having an iPod or music player port, an Internet connection, or other different perks that even other Bowflex products might offer.